Looking to build on the fifth place finish achieved in season 1999-2000, manager Stuart Robertson assembled a strong squad, including new faces John McGowan, Barry Joyce and the three Yuill brothers Alan, Jamie and Ross. It was to be a year when the depth of the Vale squad was tested to it’s limit with injuries, suspensions and unavailability taking it’s toll. Gavin Selkirk, Phil Johnson and Robbie Clark all missed significant periods of the season, while Euan Hoy, John McGowan, Barry Joyce and Scott Dyett struggled with fitness problems throughout the campaign. And following the loss of Hugh Sneddon to Coldstream in December, an astonishingly hectic end of the season schedule had to be completed without the services of key figures Jack Diamond and Lindsay Rathie. Pre-season kicked off on July 17th with a friendly against Hibernian. The 5-2 scoreline in favour of Hibs was the only pre-season defeat for Vale, as they went on to register wins over Links United, Stow, Earlston Rhymers and Kirriemuir Thistle, while a game against Dalkeith Thistle ended all-square. 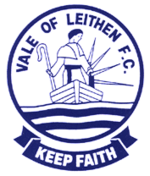 The opening four league fixtures resulted in two wins and two defeats and the Scottish Qualifying Cup saw Vale overcome Hawick Royal Albert before being paired with Coldstream in the Second Round. Having already faced the Streamers in a league fixture and recorded a comprehensive victory, Vale were confident of progressing, but could only stutter to a 0-0 draw at Home Park. Replayed at the second time of asking after the first attempt had to be abandoned, Vale had several players missing through injury, boss Stuart Robertson away on holiday and had to substitute top scorer Scott Dyett early in the game due to hamstring trouble. Steven Shennan opened the scoring for Coldstream after 11 minutes and Vale missed a number of good chances before Peter Moffat equalised in 69 minutes. However, with six minutes of the game remaining, Keith Wilson fired home what proved to be the winning goal for Coldstream. Although disappointed at the Scottish Qualifying Cup exit, during the rest of the calendar year, Vale saw off the University sides from Edinburgh and Heriot-Watt to reach the Quarter Finals of the Image Printers Cup and added another nine league points to their total. The first game of 2001 saw Vale collapse at home to Premier Division newcomers Threave Rovers. Andy McGinlay opened the scoring for the visitors in 24 minutes, then added another shortly after. A further two goals from Mark Adams, plus strikes from Gary Cochrane, Kevin Fraser and Michael Kirkpatrick completed an embarrassing rout. Two excellent away league victories at Spartans and Gala Fairydean – the latter featuring a goal-scoring return for Phil Johnson after knee surgery – lifted spirits, but Vale then crashed out of the Image Printers Cup after a heavy defeat at the hands of Craigroyston, the aftermath of which saw the end of Stuart Robertson’s four and a half years in charge as he tendered his resignation. Coach Willie Hume, who had previously spent six years at the helm at Coldstream, was put in temporary charge, assisted by goalkeeper John Reid, who in turn handed his captaincy to defender Barry Joyce. The new management team’s first game in charge was another meeting with Craigroyston, this time in the League Cup. Despite Craigroyston being reduced to 10 men after half an hour, Vale struggled to make the breakthrough and the game went into extra time before goals from John McGowan and Alan Yuill sent Vale through to a meeting with Edinburgh Athletic in the next round. In April, with the foot & mouth epidemic at it’s height, a controversial away fixture to Annan led to Vale putting in a protest to the league. The South of Scotland League had already been abandoned due to fears of the disease spreading to farming communities as yet unaffected, but the East of Scotland Association insisted that fixtures involving travel to Annan and Castle Douglas should proceed as normal, albeit with diversions avoiding troublesome areas and with vehicles passing through distenfectant stations. In the end, heavy rain prevented the game from going ahead on it’s original date on the 7th April and it was eventually played on the 28th, with Vale putting precautionary measures in place after seeking advice. Victory over Edinburgh Athletic in the League Cup marked the beginning of an incredible period of activity which saw Vale reach the League Cup Semi Final and the King Cup Final, while battling to catch up with League fixtures. A League game against Easthouses Lily saw Barry Joyce suffer a thigh injury and Scott Dyett sent off in the closing stages to put further pressure on a stretched squad and by the end of April things had taken their toll with Vale’s league position now depending on how teams below them performed. May saw a schedule of 10 games in 25 days, with a League Cup Quarter Final game against Whitehill Welfare a particular highlight. In circumstances as bizarre as football ever gets, drama off the pitch saw Whitehill manager Mike Lawson resign minutes before the match was due to start. Once the match got underway, the home side, despite having Neil Devine red-carded after an hour of play, opened the scoring towards the end of regulation time through a controversial penalty when Willie Bennett appeared to stumble over the ball. John Bird dispatched what looked like being the winner from the spot, but in injury time Euan Hoy headed home a Robbie Clark cross to take the game into extra time. Vale pressed for the winner, but 10-man Whitehill held firm, looking content to take the game to penalties. In the shoot-out Vale appeared to be on easy street, racing into a two goal lead as Whitehill missed both their opening penalties, but the crossbar and a save took the kicks into a tense stand off at sudden death, with Vale captain Barry Joyce keeping his head to blast the winning penalty home and take Vale into the semi-final where they were unfortunately denied a place in the final by Civil Service Strollers. In the King Cup a cracking Second Round tie with Strollers saw a no scoring first half, followed by a torrent of goals in the second period. Vale twice came from behind to put their noses in front with 17 minutes remaining, but Strollers’ Tony Currie completed his hat trick to level things. Scott Dyett had a golden chance to win the game for Vale as a Barry Joyce free kick found him unmarked six yards from goal with practically all the time in the world to pick his spot, but he sent his header agonisingly wide to add another game to the busy fixture list. The replay – also played in Innerleithen as with the season by now over-running, the Civil Service Sportsground in Edinburgh was in use for the cricket season – saw Vale overcome their opponents to set up a semi-final meeting with Lothian Thistle. A Peter Moffat double and one from Euan Hoy at Victoria Park saw Vale reach their first final in five years. Unfortunately, in the final played at Ferguson Park, Rosewell, a two goal defeat at the hands of Spartans put paid to Vale hopes of capturing some silverware to show for their efforts. With the energy-draining cup runs, Vale’s league form suffered and they took only a point from their last six Premier Division fixtures to finish in eighth position, only a point off the relegation place occupied by Civil Service Strollers and on the same goal difference. The intense end to the season with it’s demands on players carrying injuries and the earlier upheaval at management level meant that the end of the season was viewed more with relief than anything.